I began reading palms in 1995. Some palm readers use scientific methods; others connect through psychic channeling. I do both. I have a solid background in hand analysis, as well as a longstanding spiritual approach. My formal studies of hand reading are based on the foremost Western lineage of palm reading: Dr. William Benham’s research from the early 1900s. Schooled in Benham’s scientific findings, I am able to interpret the multitudinous data points present in every hand. I also have years of metaphysical training, with a particular focus on shamanism. By connecting deeply with the wisdom of the earth, I am able to surface information from the other side about you and your life. In addition, I have a business background in internet strategy, user experience, content creation, business analysis, and project management. Fully grounded in the “real world,” I know how to make esoteric information relevant to your day-to-day life. Listen to my palm reading interview on Sirius radio - The Janette Barber Show - September 28, 2011. Listen to an audio interview of me with photos created August 26, 2012. 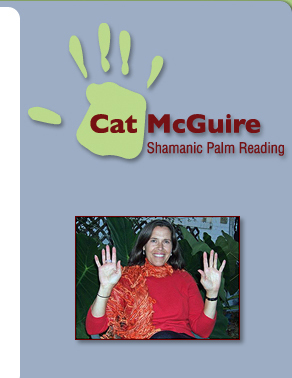 If you would like to add a testimonial, send an email with your comments to cat@catmcguire.com.